Have you ever clicked selfie? If yes then you already knew about Instagram. People are fond of taking selfies and sharing them on Instagram. Instagram has also helped common people to become celebrities. 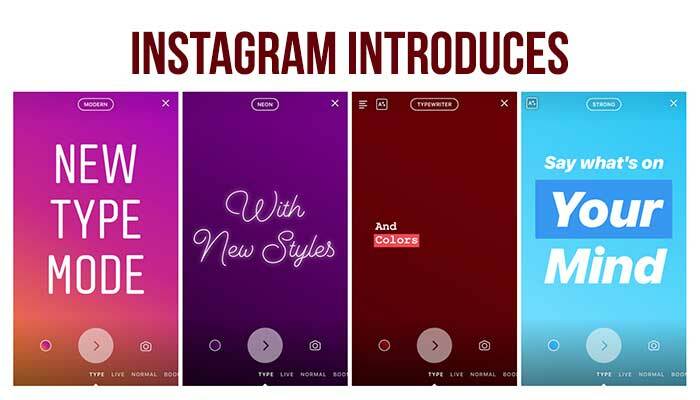 Instagram keeps on improving its interface and technology to make it more user-friendly. How to Be a Successful Instagrammer? Till now, it was not possible to publish text-only stories on Instagram. But now, Instagram has updated its popular stories feature and introduced new text-only stories. Now you can publish stories without photo or video on Instagram. You need to access "type" mode from your smartphone camera screen. You will find it below "record" button. All you need is to select "Type" and you are in type mode to write a message. You can select various text styles from the top of your smartphone screen. You can also add emphasis to the word you want to highlight. You can also add various text styles when using text with videos or images. You need to update your Instagram App in order to publish text-based stories on your Instagram.